If the holidays fill you with a certain kind of terror associated with the hassle of planning elaborate gatherings, yet you still find yourself wanting to host an event at home, look no further than the inspired option of a cheese-tasting party. Filled with the celebration and festivity of the season, but among the simpler gatherings you can plan, cheese-tasting parties allow you to set the pace according to your own appetite for complexity. 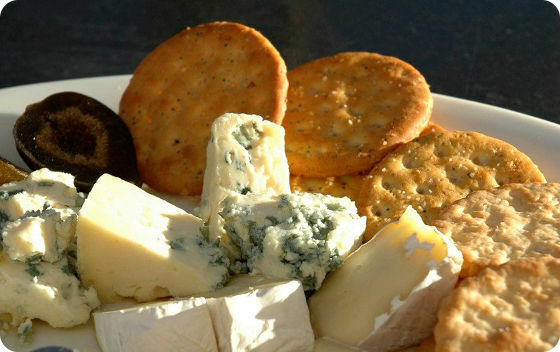 A cheese-tasting party can be as simple as a handful of complementary cheeses, some fruit (fresh and/or dried), some nuts (candied, spiced, or plain), and some cured meats and/or olives. I usually prefer to add a couple of bottles of wine (one red and one white) for enjoying alongside my offerings. You can, of course, opt to make fancy appetizers and snacks to accompany the cheese or even opt for special cheese-centric offerings that blend chilled and warmed items. But my point in this article is that you can throw together an event with little warning and still have a memorable time with family and friends. One of my favorite ways to begin is by choosing a generous cutting board and setting a different kind of cheese at each of the corners of the board and maybe a fifth variety at the center. Make sure you opt for something soft and creamy (like brie), something tangy (like chèvre), a hard cheese (like aged parmesan), a sharp cheese (like sharp cheddar), and maybe a smoked variety or a sheep's milk cheese. Variety is fun and this is a great time to showcase fun flavors. Between the cheeses, I tend to group my other offerings. Some favorites include dried apricots, herb-marinated kalamata olives, hard salami, candied pecans, and fresh red grapes. Really, though, choose what you'd like. Do you make the world's most amazing pickled beans? Get them out there! Do you swoon whenever garlic pistachios are nearby? Well, don't keep them to yourself! You get the idea. Make sure you have enough small plates for each of your guests to lay claim to one. Refilling your tasting plate at an event like this is not only fine, but encouraged. And make sure you do the same with wine glasses. You may wish to provide an extra pitcher with water for rinsing glasses and otherwise having a glass between servings of wine. While not required, it can also be fun to provide small sheets of paper with notes about the different cheeses, accompanying foods, and wine selections. If you do that, be sure to leave room on the paper for extra notes and provide pens or pencils for your guests. Having gone to and hosted several events like this, I can attest to the value of taking notes and have found new favorites this way. And before I leave you to plan your cheese options, let me share my favorite part about hosting a cheese-tasting party: the mac 'n cheese a couple of days later. I've even been known to host a mac 'n cheese lunch with a subset of the cheese-tasting party guest list shortly after the first event. It's always a hit and you can blend leftover cheeses to make a sauce or make several kinds of sauce and let your friends dress their noodles according to their tastes! What's not to love about a 2-for-1 holiday event?